The HSGI Mag-Net Dump Pouch puts an innovative twist on modern dump pouches. Utilizing a lightweight but durable mesh lining, you get both a collapsible dump pouch when not in use with large storage capacity. The mesh lining prevents dirt, debris, and water from building up within the pouch, and allows you to see exactly what's inside. A rigid tube supports the opening preventing it from collapsing in itself so its ready when you are. 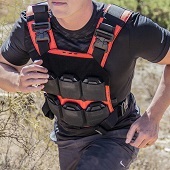 The Mag-Net Dump Pouch attaches to any MOLLE compatible system via included HSGI clips.